Whenever I think of Fish and Chips, I’ll think of Handle bar. 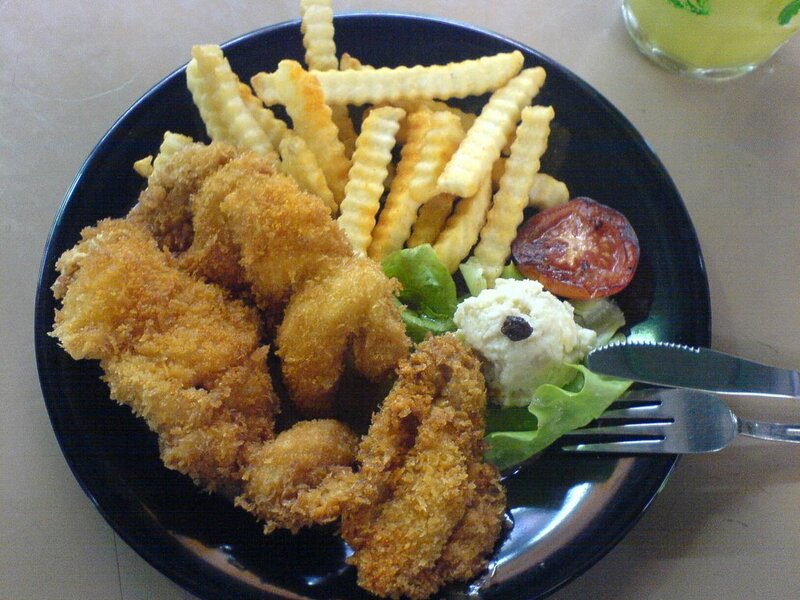 Whenever I think of Chicken Cutlet, I would think of AMK S11’s Rasa Sayang. Anyway, I found a place that can fight with Rasa Sayang’s chicken cutlet. Its at Bukit Timah Market. The stall name is call Tom Kitchen. The cutlet taste good. Below the cutlet is some black pepper sauce. Its interesting that they choose to put the black pepper sauce at the bottom instead of pouring it over the cutlet. It sort of ensure that the cutlet is still crispy and not soggy when you eat it. The chicken cutlet comes with the usual fries. I think they sprinkle some curry powder over the fries to make it taste nicer. The home made mashed potato taste fine, but the serving is too small. There is also a piece of tomato. Grilled tomato to be exact. Think they grilled it over the pan for a few sec before serving. The cutlet taste great. Should try it again someday. DHL to Cape Town??? Hahahaha…. -ET- gt a stall @ Toa Payoh Lor 1 called Pots n Pans selling western food too. not bad. cant really rem whether they sell chicken cutlet anot. (haven been there in awhile) but their lambchop nt bad. can give it a try when u head southwards.